Tasmania Police values its responsibility in delivering quality policing services to the Tasmanian community. Ensuring Tasmania continues to be a safe place to live, work and visit is at the core of our activities and we are continually exploring ways to more effectively and efficiently serve the community. 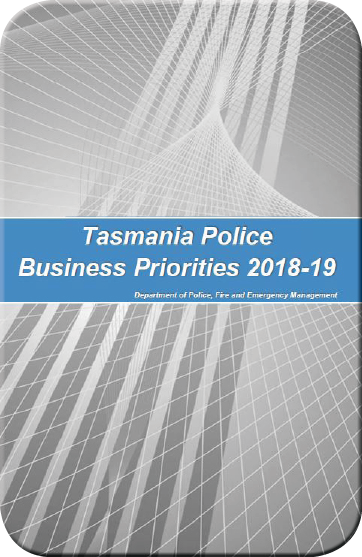 The Tasmania Police Business Priorities 2018-19 details our main areas of focus for the year ahead. This document aligns with our strategic framework – Future Focus 2017-20 – with our overarching vision of a safe, secure and resilient Tasmania; and with the Government’s election commitments that sit with our Department. Our priorities continue to focus on the Department’s four output groups of Public Safety; Crime; Traffic Policing; and Emergency Management. Within each of these output groups we will be concentrating our efforts to reduce offending and make Tasmania a safer place. This includes reviewing how we respond to youth offenders, targeting high-risk road behaviours and focussing on priority family violence perpetrators. Implementing the staged roll-out of body worn cameras. 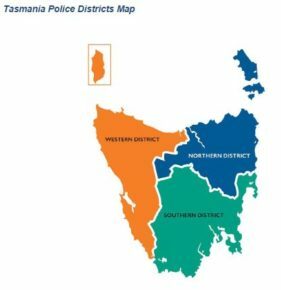 Each Tasmania Police priority area is complemented by key focus areas. These identify how we will report against, and monitor our progress. police service and a safer Tasmanian community. Tasmania Police is one of the operational arms of the Department of Police, Fire and Emergency Management. The Department’s other arms include the Tasmania Fire Service, State Emergency Service and Forensic Science Service Tasmania, with corporate support from Business and Executive Services. Tasmania Police is responsible for delivering quality policing services in Tasmania. This is undertaken through three geographical districts – Northern, Western and Southern. Each District is overseen by a commander and supported by specialised support districts. Activities undertaken by Tasmania Police include high-visibility policing; criminal investigations including Specialist Support and Serious Organised Crimes Unit operations; developing targeted initiatives; counter terrorism; emergency management; and working in partnership with other Australian jurisdictions and improving relationships with the Tasmanian community. 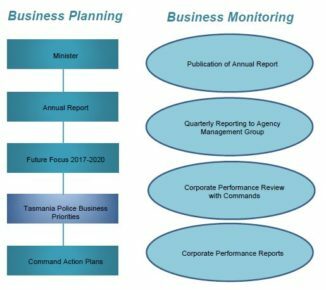 This document outlines the business priorities for Tasmania Police. These priorities support the overall vision for the Department, and many involve working in collaboration with other areas of the Agency. of our people. Tasmania Police supports this vision, mission and set of principles, and these underpin the priorities outlined in this document. A safe, secure and resilient Tasmania. To provide effective policing, fire and emergency management services. Integrity: We believe in honest, professional, transparent and ethical behaviour in all aspects of our business. Equity: We believe in fair, consistent and inclusive behaviour when interacting with our people and our community. Accountability: We believe in being answerable for our decisions and actions, behaving professionally and being responsible for our outcomes. Community Focus: We will engage and work with the community to provide effective service for the community. Collaboration: We will work together and with others to achieve positive outcomes. Values-led: Our service and behaviours will reflect our values. Professional: We will be respectful, honest, confident and competent. Accountable: We will be responsible and transparent. Community Service: Delivering what the community needs to be safe, engaged and reassured. Leadership: Having the skills and resources to be informed, accountable and innovative in what we do. People: Looking after our workforce and planning for the future. Communication: Ensuring that our messages are heard by the community and that their voices are heard by us. This project will review the future context facing Tasmania Police and the capability to deliver on key priorities. It will consider the changing nature and growing sophistication of crime, including youth offending, and how this is compounded by the increasing pace and scope of cyber and digital crime. The project will also look at how sworn officers should best be dispersed among districts and business units, considering the election commitment of an additional 125 police officers. Two new stations will be built under this initiative, with consultative support from Tasmania Police. These projects will result in more contemporary police premises in New Norfolk and Longford. Planning will also commence for the development of facilities in Sorell to allow Tasmania Police, State Emergency Services and the Tasmania Fire Service to be co-located. This initiative will explore options for the use of UAVs to enhance policing and investigative capabilities. Tasmania Police will implement the Government’s commitment to improve retail security. This will include supporting a no-interest loan scheme for small businesses to assist with preventing thefts and identifying offenders. The scheme will allow businesses to install good quality, high-definition digital recording cameras for closed-circuit television. This initiative will involve enhancing Tasmania Police’s crystalline methamphetamine (‘ice’) and other high-risk drug investigation capabilities by reviewing current staffing allocation and identifying areas which could be improved. This initiative will provide for the implementation of the staged roll-out of body worn cameras for frontline members of Tasmania Police. This will allow a mechanism for contemporary gathering of evidence and intelligence, and enhance the safety of officers. Project Unify is a digital transformation initiative. This project will upgrade a number of Tasmania Police information and communication technology systems, which directly and indirectly support policing operations and external clients. This initiative involves the development and implementation of a proactive preventative program for the physical and mental health of emergency first responders. It will provide intervention and support, as required. The Family Violence Electronic Monitoring project is a jointly funded initiative by the State and Australian Governments. The project will explore whether GPS and electronic monitoring can make a difference to deterring or reducing the occurrence of violence and enhancing the safety of victims of family violence and their families. This initiative involves developing a policy to support rural and remote stations that experience extended absences. The policy will aim to prevent small stations being unmanned and will involve consultation with the Police Association of Tasmania, the Department of Treasury and Finance, and operational commands. Participation in Review of Strategy – November 2018. This page -- https://www.police.tas.gov.au/historical-corporate-documents/business-properties-2018-2019/ -- was last published on July 11, 2018 by the Department of Police, Fire and Emergency Management.